Synopsis: Just call her Christmas Eve… Eve Harmon has always enjoyed Christmas, but this year it reminds her of everything she doesn’t have. Almost all her friends are married now, and that’s what Eve wants, too. Love. A husband and kids of her own. But the B and B she manages, and even Whiskey Creek, the small Gold Country town where she was born and raised, suddenly seem…confining. My take: The Heart of Christmas is one of those books that’s almost impossible to stop reading – at least it was for me! It’s book 7 in the Whiskey Creek series but it can stand alone. The Heart of Christmas is filled with romance, suspense and a mystery. I loved the story of Eve and her handsome stranger. I couldn’t imagine how Brenda Novak would find a way to happiness for these two but I think she really hit this one out of the park (no spoilers here). I can’t wait to see what she dreams up next for the group of friends in Whiskey Creek. Recommended to fans of the series and anyone who enjoys a good story. 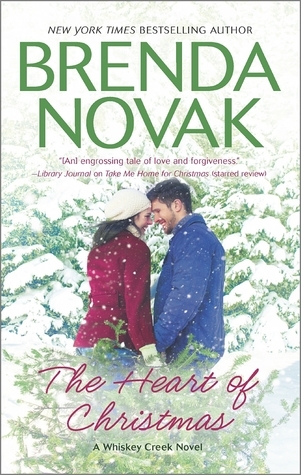 Note: Several weeks ago I happened to see a tweet from Brenda Novak telling readers that a characters from her book INSIDE would be one of the featured characters in The Heart of Christmas. Many readers requested his story going forward from INSIDE. You don’t have to read INSIDE but I did and learned a lot of background on the character. That said, Novak does a great job informing readers of his background in The Heart of Christmas. James Claussen has played Santa for years, but now that he’s a widower, he’s lost interest—in everything. So his daughter, Brooke, kidnaps him from the mall (in his Santa suit!) and takes him to Icicle Falls. She’s arranged a special Christmas at the lodge owned by long-widowed Olivia Wallace and her son, Eric. And yet…Brooke wants Dad to be happy, but she’s not ready to see someone else’s mommy kissing Santa Claus. Single mom Missy Monroe brings her kids to the lodge, too. Lalla wants a grandma for Christmas, and her brother, Carlos, wants a dog. Missy can’t provide either one. What she’d like is an attractive, dependable man. A man like John Truman… But John’s girlfriend will be joining him in Icicle Falls, and he’s going to propose. 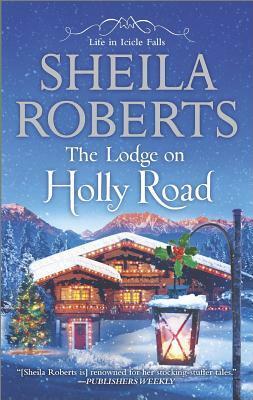 My take: If you’re looking for an entertaining Christmas novel this year you’ll want to read The Lodge on Holly Road. It’s part of the Life in Icicle Falls series but can stand alone. Seriously, if you haven’t read any of the previous books you will not be missing anything in this book. Sheila Roberts is in top form with her novel of good intentions going astray. From the daughter who wants her widowed father to have a great Christmas to the single mom of two who wants to give her kids the Christmas she always wanted to the young man who can’t wait to publicly propose to the woman of his dreams – everyone will learn valuable lessons. I enjoyed all the characters – from the main characters to the minor ones (lodge guests). They are all fully formed and interesting. The setting is great – Christmas in a mountain resort town. Synopsis: In a small town, reputation is everything. In her latest novel, #1 New York Times bestselling author Robyn Carr explores the burden placed on a young man returning home to face his mistakes—the first step in claiming the life he was meant to live. Seth has come to terms with the turns his life has taken. But now he’s been presented with an opportunity to return home and show his father—and the people of Thunder Point—he’s become a better, humbler version of his former self. My take: The Homecoming is another good addition to the Thunder Point series. It was quite different from the other books, I thought. Yes, there’s romance for Seth and Iris and they have issues to work through, but, at the forefront, is the issue of possible physical and verbal abuse – at Thunder Point High School. I thought Carr did a good job with this storyline. The novel culminated with a dramatic scene. As everything played out – the pages almost turned themselves. 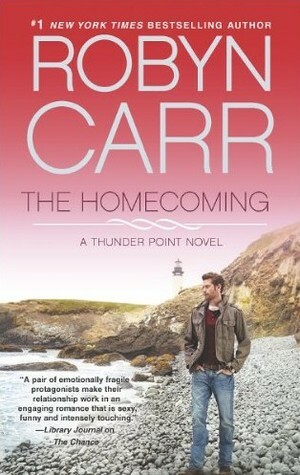 I can’t wait to read Carr’s next book in the Thunder Point series and hope I don’t have to wait too long. 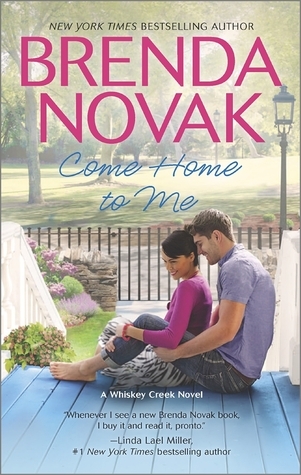 Recommended to fans of Contemporary/Small Town Romance and Robyn Carr. My take: Robyn Carr takes us back to Thunder Point, Oregon and this time Scott Grant, the small town’s doctor, is the main character. When his wife died after their second child was born he decided to move to Thunder Point because it would be more conducive to raising his children – and he wanted to practice medicine in a small, underserved community. Four years of living in the small town has proven his decision a good one. The only thing he needs is someone to work alongside him at the clinic – someone who’s willing to work for almost no pay. When Peyton Lacoumette walks in the door and then agrees to give the job three months he can’t believe his good luck. Scott and Peyton’s story was so enjoyable. They’re not perfect but together, at work and after work, their relationship was real and so sweet. The scenes at home with the kids tugged at my heartstrings. Scott would do anything for Peyton. After her previous relationship with another doctor ended terribly she’s not so sure she can start a new one with yet another doctor. And what will happen when the previous doctor shows up at Scott and Peyton’s office asking for a second chance? 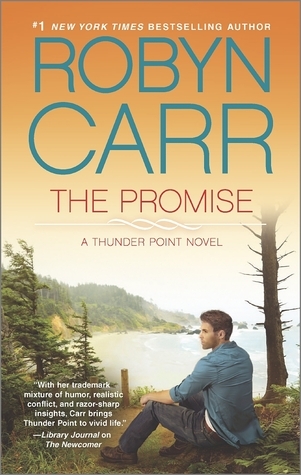 As I’ve come to expect from Carr, The Promise is an emotional story filled with love, heartache, and hope. I enjoyed it and look forward to the next book in the series. Recommended to fans of Robyn Carr, the Thunder Point series, and small town contemporary romance. Synopsis: After a fake food poisoning incident in L.A., Bailey Sterling’s dreams of becoming a caterer to the stars collapse faster than a soufflé. Now Bailey’s face is in all the gossip rags and her business is in ruins. But the Sterling women close ranks and bring her back to Icicle Falls, where she’ll stay with her sister Cecily. 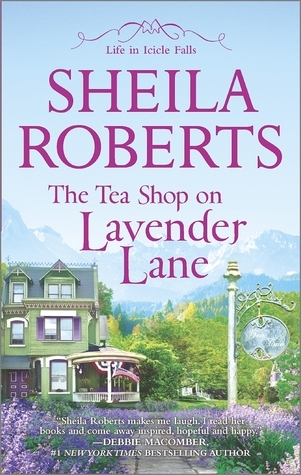 All goes well between the sisters until Bailey comes up with a new business idea—a tea shop on a charming street called Lavender Lane. She’s going into partnership with Todd Black, who—it turns out—is the man Cecily’s started dating. It looks to Cecily as if there’s more than tea brewing in that cute little shop. And she’s not pleased. My take: Sheila Roberts takes us back to Icicle Falls and the Sterling family. This time we find out if sisters Cecily and Bailey can figure out their love lives and remain good friends/sisters. Not an easy thing to do – feelings are hurt, egos are bashed. But what can you do when your matchmaker sister can’t figure out her own love life? We also catch up with the third Sterling sister, Samantha. New exciting things are happening in her life as well. I thought The Tea Shop on Lavender Lane was another cute story in the Icicle Falls series. It was more on the light side than you might think and I enjoyed it. At the end there’s an excerpt from the next book in the series: The Lodge on Holly Road. Sheila also included a few recipes from Bailey’s tea shop. Synopsis: Isabel Johansen, a celebrated chef who grew up in the sleepy Sonoma town of Archangel, is transforming her childhood home into a destination cooking school—a unique place for other dreamers to come and learn the culinary arts. Bella Vista’s rambling mission-style hacienda, with its working apple orchards, bountiful gardens and beehives, is the idyllic venue for Isabel’s project…and the perfect place for her to forget the past. But Isabel’s carefully ordered plans begin to go awry when swaggering, war-torn journalist Cormac O’Neill arrives to dig up old history. He’s always been better at exposing the lives of others than showing his own closely guarded heart, but the pleasures of small-town life and the searing sensuality of Isabel’s kitchen coax him into revealing a few truths of his own. 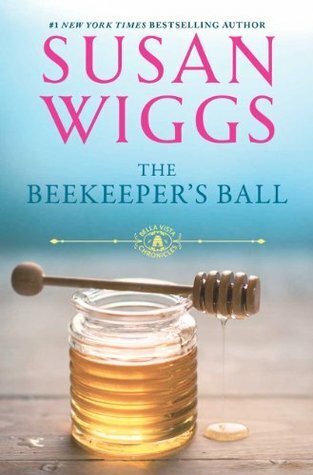 My take: Susan Wigg’s lush descriptions drew me right into The Beekeeper’s Ball. Seriously, I’d love to enroll in Isabel’s cooking school and take in all Bella Vista has to offer! Mac, an accomplished author, has arrived to write Isabel’s grandfather’s story. He was part of the Danish Resistance during WWII and, along with a few other people in Isabel’s life, came to the US when the liberation began. Magnus (the grandfather) has quite a story to tell Mac. He wants to get that story out because the truth needs to be told. That theme winds through the novel. Mac encourages Isabel to tell her truth – to herself and her loved ones. That takes extraordinary courage and she’s not sure she has it in her. Another storyline is one that involves Isabel’s father. He died in a tragic crash on the day she was born. Isabel never had reason to doubt this truth she’d been told by her grandparents. They raised her because her mother died after giving birth to Isabel. Mystery begins to swirl around this storyline and I expect it to continue in the next book of The Bella Vista Chronicles. I enjoyed the message of the dual stories in the book: Magnus and his friends rising to help in the Danish Resistance before moving to a new homeland and Isabel and Mac rising to help the people in their lives. The past is the past. Embrace the future. Note: Although I haven’t yet read the first book in the series (The Apple Orchard) I didn’t feel lost. Wiggs did a good job explaining references to events and people from that book.